I am still crushing on this combination of blue, greens and blush pink. Not something I would have deliberately thought to put together, but somehow it all works to make me very happy. Originally the idea was to make postage stamp basket blocks with improv. string strips and then combine them with these classic looking pineapple blocks. That would have included some yellow golds and deeper pink and reds, which somehow was just a bit too clashy. Even for me! These improv. baskets have been an interesting experiment as they don't just scream out the fact that they are baskets. 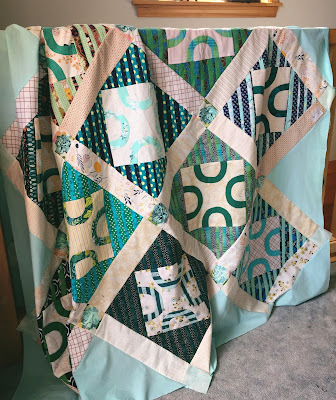 That was a little surprising to me, but maybe it's because I mixed the fabrics for the handles up a little too much and didn't use enough of the darker colored fabrics? Regardless, I do still like them. A lot! So that's good. Onward ho! 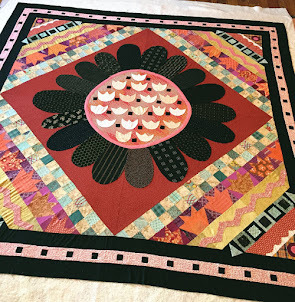 Not sure if you can tell from my over-exposed pics, but all the darker roses went into the center of the quilt and the lighter colored ones to the middle-outside edges, then a lighter tone on tone fabric to the very outside edges of the quilt. It seemed to come together just fine though, and really, no reason to panic about some of the roses perhaps not being 'perfectly' centered. 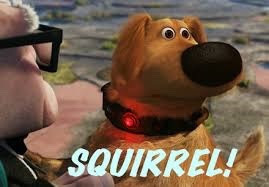 We quilters are so funny sometimes, the things that can push our buttons. Still haven't managed to figure out quite what to do with all those pineapple blocks, but ideas are absolutely simmering somewhere on the back burner. 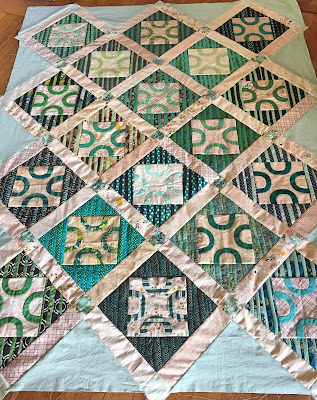 In the meantime, I've just about convinced myself that this quilt won't be needing a border after all--you know that's the default position around here. So that's that. It's all trimmed up now and resting with the oodles of other quilt tops waiting for sandwiching and quilting. 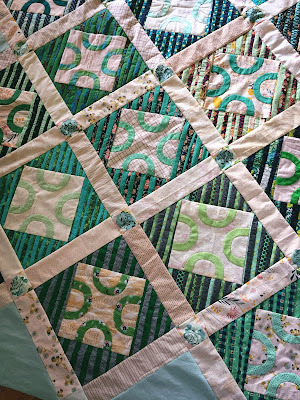 Two down, two to go on these blue/green quilt spin-offs. Maybe I should start calling it the 'Don't Tell Me What To Do' series? Over the previous weekend I also addressed the applique prep for the latest big basket quilt. Just a matter of making some final decisions about fabric and proportion and then getting pieces cut out. As usual I am nervously wondering if the flowers will be large enough after the seam allowance is turned under. That's the main thing that gives me concern until most all the stitches are completed. 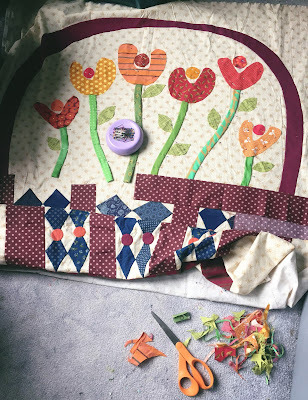 As I already increased the size of the drawn out flowers by two more seam allowances, I'm making myself leave it alone at this particular point. Oh yeah, I have already sewed another seam on the bias vine to make it more narrow than the original desired width. You know, for proper 'proportion'. *sigh Enough is enough. Freehand applique is always such a trial and error process anyway. No way to know for sure about the end result until hello? it's a done deal. If it ends up looking terrible, then I'll just rip it out and start over. Good thing I don't make patterns as the end result is always a totally different shape and size from the original. I always wonder on free form applique if I am making it the right size too - guessing is about all we can do. I hate also when I do not have enough fabric!! It appears your improv baskets have finally let you rest on the perfect ending. 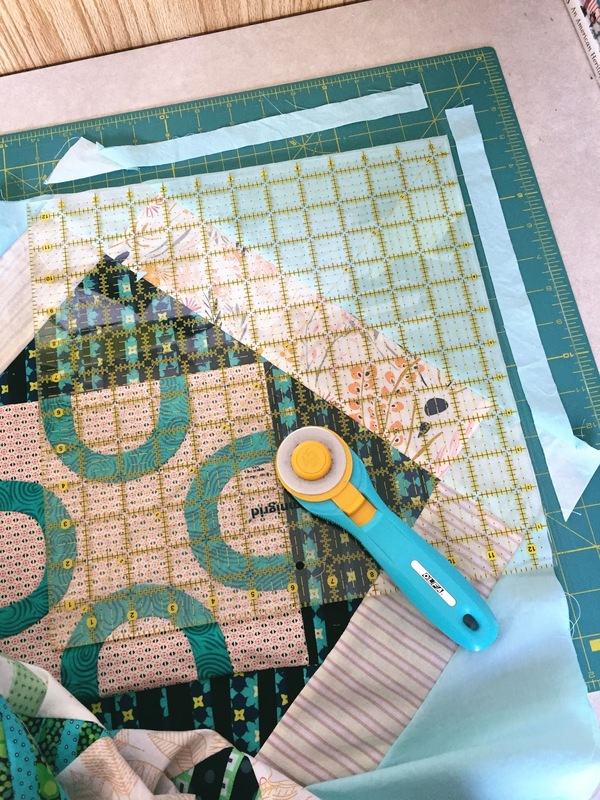 I love the look and idea of make it do, but I always end up looking for more of the same fabric if it appears that I'll run short. Oh, well. I did not realize that the baby quilt was made from basket trim-offs. Great job! I really loved that quilt. It's always interesting to follow your design process. I love the tulips in your basket quilt. I've been wanting to make something with tulips in it all spring but have resisted the muse in order to finish other things. Wish I could see your blue and green basket quilt in person. I want to softly rub my hands across the baskets to feel the texture. Silly, I know. hahah, your post made me laugh. I am also a very don't tell me what to do type of person. 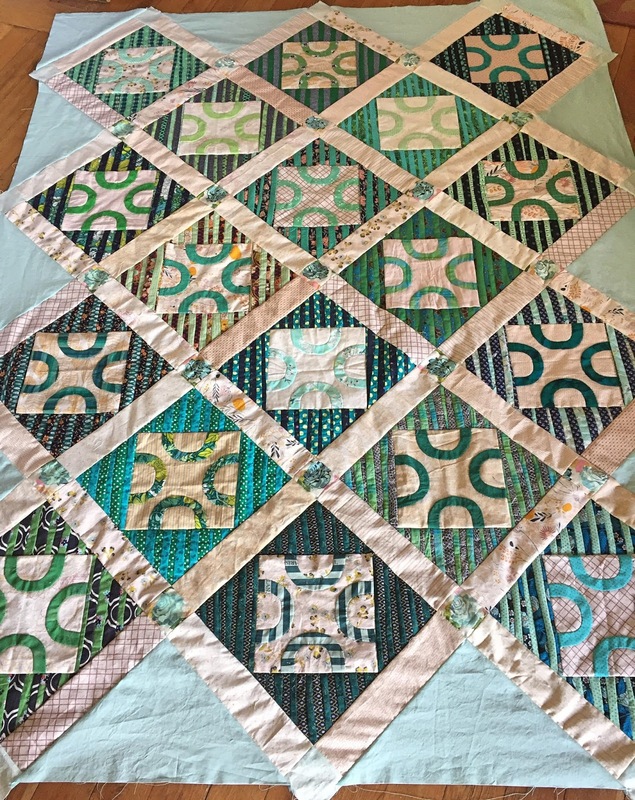 it made me so happy to see these blocks come together! I wouldn't have thought to combine blush pink with these strong blues and greens. Thanks for pointing out the rose shade placement, too. I had to laugh with you about the silly details that drive us nuts. We don't need anyone else telling us what to do. Our crazy inner voices are sufficient. So good to see your Improv Baskets top finished!! It's lovely. This is such a surprising colour combination but I LOVE it. In fact it's one I'd like to try myself at some point. 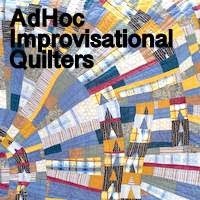 I like that this has gone its own way (and Don't Tell Me What To Do is a great name for a quilt series).